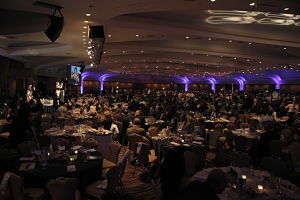 Over 1200 guests attended this 2012 event in Washington, D.C. Managing a crowd this size isn’t easy! Just because your benefit auctioneer knows how to manage 250 people doesn’t mean he’s ready to oversee your gala of 1,000 guests. But his experience level might suggest that he needs to stick with smaller groups for a couple more years (or longer). If you move forward, you’re taking a risk. In today’s podcast, learn how to negotiate those risks.